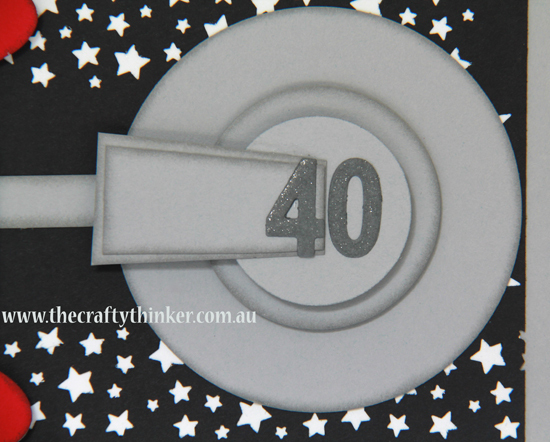 One of the guys in the office is turning 40 next week so I made a card for him that we can all sign. As you can probably guess, he's a big Star Trek fan! He has used various sound bites from the show as incoming message alerts on his phone. He also has the sound of a Wookie from Star Wars (that's his wife's ringtone!) but I thought The Enterprise would be easier to produce than a Wookie! Also - I had seen two cards on Pinterest! One is by Virgo5 who CASEd one by crazykim over at Splitcoaststampers. I used the Confetti Stars Border punch and the star from the Itty Bitty Accents Punch Pack to punch the stars in the Basic Black cardstock which I then layered over a slightly smaller piece of Whisper White cardstock to create my starry background. I could only punch as far as the punches would reach - so it looks a bit as if the ship is cutting a swathe through the galaxy! The ship is mostly cut from Smoky Slate, sponged with the same colour ink. There are a couple of little bits of Real Red and a little bit of Whisper White. 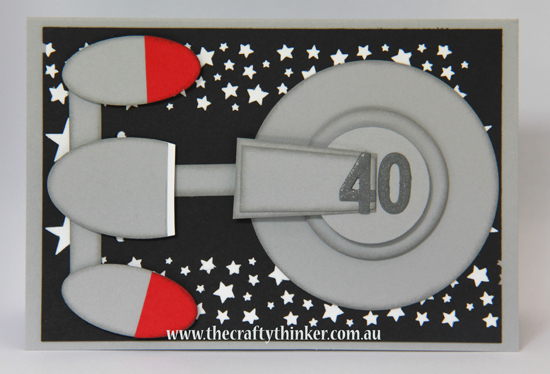 I used the Large Oval Punch for the nacelles and one of the Ovals Collection Framelits for the .. other oval bit! The saucer part was cut with Circles Collections framelits and all the other little bits were hand cut or left over strips. I cut the numbers from Basic Grey cardstock and gave them a coat of Clear Wink of Stella. If you'd like to shop for items - simply click on the image below.